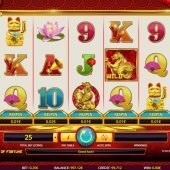 Tree of Fortune slot is a rare Oriental theme from iSoftbet - maybe they thought Red Dragon Wild was getting a bit lonely? Never fear as iSoftBet slots are generally good across the board and whichever theme they use they should do it well as we have seen with their TV and Film-based games such as 24 and Paranormal Activity. That said, the graphics are pretty plain here with white reels against a lucky red background and the archetypal Chinese pipes-and-cymbals music is equally unspectacular, so what fruits can this tree produce for us? We have a 243-way game with no paylines and thus have the appropriate 5 reels of 3 rows each for this format. Symbols are all single and the pays aren't bad for a 243-way slot. We pay 25 coins per play and only get Wilds on reels 2 and 4 so there's no 5-of-a-kind for them, but the rest are: Golden Cockerel 160x stake, Golden Cat 100x, Lotus Flower 80x, Tokens 40x, Firecrackers 20x with six card values paying 8, 6 or 4x each for a full way. This tell you quite correctly that Tree of Fortune is quite volatile. iSoftBet have borrowed the re-spin feature used by Microgaming on some of their slots such as Dragon Dance - if you get say 2 scatters anywhere or matching symbols on say reels 1,2,4 and 5 you can re-spin the third reel over and over for a fixed price worked out by the slot until the missing symbol comes in, or third scatter. This is expensive, I don't like it and it doesn't make the game pay any more than playing it normally. Yes, very funny, Free Spins are triggered by 3 or more scatters anywhere in view and are very simple. You get 15 at 3x multiplier and they can be retriggered. No enhancements, same reels and nothing else to add except that now's a good time to get the Golden Cat or Cockerel 5-of-a-kinds which now become 480 or 300x bet for one way.